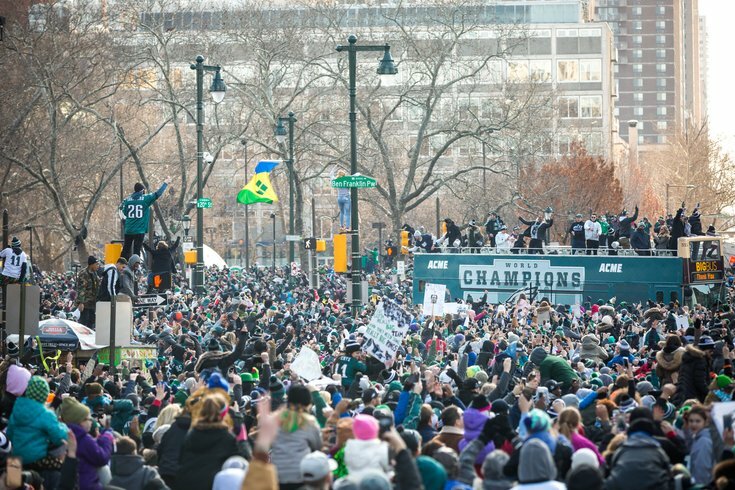 The Philadelphia Eagles parade along the Benjamin Franklin Parkway at 20th Street during the Super Bowl championship parade, Thursday, Feb. 8, 2018. The Eagles parade was awesome. Everybody – but for a few unfortunate souls – knows this. From our muddy vantage point along the Ben Franklin Parkway, one thing that helped pass the time was the awesome playlist blaring through speakers all morning and early afternoon. Such a memorable set of songs shouldn't just be heard once. If you're anything like me, you wanted to know the set list so you could listen to it over and over again. That's why I reached out to Fred Stein, who produced the parade, in an attempt to track it down. The Eagles hired the DJ, Brandon Williams of Pure Event Group, so it took a few days to get the information. But secure the playlist we did, on Tuesday afternoon. With no further ado, here are all the tracks that played – according to the spreadsheet, between 10:16:50 a.m. and 3:13:06 p.m. on Thursday, February 8, 2018 – as the Super Bowl champion Philadelphia Eagles made their way from Lincoln Financial Field to the front steps of the Philadelphia Museum of Art. Here's a quick playlist from Spotify for your listening enjoyment. Feel free to create your own. Update: An eagle-eared reader pointed out that they played Queen's "We Are the Champions" after the speeches which started upon the end of the playlist.